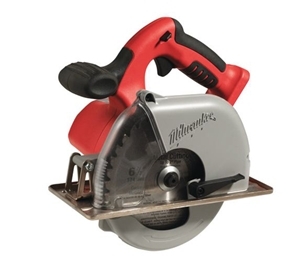 The Milwaukee HD28MS0 is a powerful 28v metal dry cutting saw that is capable of 3200 rpm and using the lithium batteries it delivers constant fade-free power that ensures you last cut has just as much power as the first. This model cuts mild steel, aluminium and insulated foam panel with its premium 174mm carbide blade. It is a compact and well balanced design with a soft grip handle to give the user as much comfort as possible during use. The safety features of this model are it comes with motor overload protection and the electronic motor brake which stops the saw blade within seconds. the built in LED light gives illumination of the cutting area and clear entry point of the blade.